I just made these this evening along with the sauce! FREAKING FANTASTIC!! Wow. They tasted almost like Pizza Hut pan pizza crust. They were so soft and flavorful with a buttery, mildly crunchy crust. I also used a homemade garlic seasoning along with a small medley of Italian cheeses. Thank you for this recipe. I plan to use it as pizza crust. Also, I put half of the dough in the fridge to rise a bit and then threw it in the freezer for later. thinking about making these for an after school snack, but dont hav a kitchen aide, can you use a regular blender or food processor with a blade? also no butter can I use oil…do you have any ideas on your blog for after school snacks, just came across this today. Thanks for the interesting itmfroanion. I have always wanted to buy a bread machine. I read many of the bread machine reviews and must say I do not know which bread machine to purchase. Which bread machine is the best? Which bread machine has the best reviews? Which bread Machine has the best consumer ranking and no complaints? Thanks so much for your help. this is the first time i attempted making breadsticks (as my bf and i love pizza hut's sticks) and they turned out great!!! i tried making pizza and bread before and both times they've turned out too doughy but this recipe i followed to a “t” and was delicious!! thanks so much for sharing. now i have a go-to for breadsticks! Im throwing my fiance a bday party this weekend and am making these. I didn't want to wait until the last minute to do it so i was wondering if i could make the dough, and let it sit for a couple hours rather than just 5 minutes. Or even possible freeze it? I still want them to taste fresh so just let me know what would be best. okay thanks! Thanks for your question, and I'm so glad you dropped by to ask it. This is what I know, the dough for this particular recipe doesn't do well if it's left to sit for a while. It has a lot of yeast in it (thus the “quick” part). The final product ends up tasting really yeast-ie and not great at all. I have tried making start to finish several hours in advance, letting them cool on a wire rack and then storing them in an airtight container until I need them. They aren't as good as they are fresh from the oven, but they still taste quite good. i've been reading your blog for a while and have never posted. i HAD to post how much i loved these breadsticks, though. SO SO good. i've been addicted to my bread machine to make dough and this is the first time i've used my kitchenaid. it was easy and i will be making these again and again. thank you so much!! I've had these bookmarked for so long, I finally made them tonight. So good! Super easy, and super delicious. It's a definite keeper!! Made these tonight, didn't have Johnny's garlic seasoning but I just used the recipe on http://www.ourbestbites.com/2008/04/garlic-bread-seasoning/ and gosh.. these breadsticks are so delicious and perfect and fast and easy. Thank you so much for sharing this recipe! Hi Jamie! I found your blog several weeks ago and I have to say I love it! We now use this recipe every time we eat pasta (about once a week). We LOVE them!! Thank you for saving us from the bread sticks “out of a can”. My new favorite spaghetti sauce is your Hearty Spaghetti Sauce from your March Menu Plan. Sooo good! Just found this via Pinterest. (what else?) I read “Johnny’s” and thought, “I don’t even know what that is. I’ll have to use what I’ve got. Look in my cupboard. Johnny’s. I feel like a tard, but woot! It really is fabulous, isn’t it? This recipe was amazing. I actually cut the recipe in half to make them for 2, and cooked it in a round cake pan. We loved them! With garlic salt, they tasted just like Fazoli’s. We may have used a bit more butter to make it that way… Thanks!!! Thank you so much for this amazing recipe! I’ve made the bread sticks and used the dough for pizza. Tonight I shaped the dough in the pan and did half pizza and half garlic bread. I used half a stick of butter, 1/4 tsp garlic powder and a sprinkle of parsley. It came out wonderful, this dough is so easy to work with. Thank you again! Okay, what is Johnny’s garlic seasoning (never heard of it) and I don’t own a pizza cutter. And I do own almost every gadget. This is supposed to be the very easiest yeast thing? I want to try…..but…..
Johnny’s Garlic Seasoning can be found at Costco. If you can’t find it you can easily substitute a bit of Italian Seasoning and Garlic Powder mixed together. Good luck! 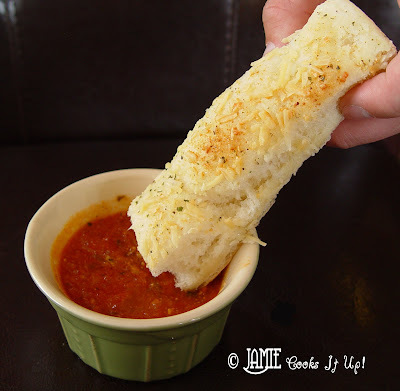 I have tried many breadstick recipes and this is by far the best! The only one I make since I found it. However, it might be nice if you could remove the word $&@* by butter in the ingredient list. I don’t see why that is necessary – I cook with my kids and this is the first time I have ever encountered a recipe written like that. Not very classy. Seriously? You’re complaining over the word ‘crap’? Out of all the other words she could have used in the world that are far more colourful… you’re complaining about that one? The reason she put “not that nasty margarine crap” is the reason why I love this writer all the more. She seems more ‘real’ and down to earth. Not uptight. Also upon looking on the other recipes on this site I’m going to be trying a LOT … and I won’t be using any of this margarine crap either! Holly – It was something my children noticed while we baking these and I thought it was kind of sad that I had to explain to them why that word would be used in a recipe! It was kind of inexplicable. I never knew that using colorful words(even the dull ones) = down to earth. If you want to call me uptight, so be it. I do know that most children would be sent to the principal for saying it, so I’m not alone in considering it crude. I also thought with the author being a mormon, that they were not supposed to use profanity. Im sorry. Is this judgement of the writer necessary? What business is it of yours that she uses the word crap? What business is it of yours that she is a mormon? I think that since you are so sensitive and that you want to shelter your children (which is totally your business) that maybe you should take a look on the pages before letting your kids see. ITS THE INTERNET!! That kind of stuff and MUCH WORSE is EVERYWHERE. Grow up and stop judging others. On a separate note…I am making these currently…and the smell SOOOO AMAZING! Sara. Being Mormon – It is something the writer says is important to her on her “about me”. U tell me to grow up and stop judging others and then do the exact same thing to me! So maybe you should grow up too??? Don’t call it a family friendly website if you are going to swear in your recipes. My kids and I found and read it at the same time. Didn’t know I had to censor recipes on a “family friendly” site! Articles like this really grease the shafts of kndowelge. Deb, Nobody tried to offend you. We were just a little surprised. I didn’t know that anybody considered the word crap a swearword, even if they didn’t like using it themselves. I don’t think it needs to be taken off the recipe and I hate swearing. Ps. Really good recipe! Thanks for sharing! Excellent recipe! I love how easy these recipes are and how the food turns out perfect. I’ve tried two bread recipes here and you are spot on with directions. I served the breadsticks to dinner guests with lasagna. So delicious. I’m going to have to look for the recommended seasoning the next time I’m at Costco. But, since I didn’t have it I substituted garlic salt and some parsley. Lindsey, I used a 17 1/2 by 12 ish inch jelly roll pan and it worked great for me, but I might do a size smaller next time so they rise a little higher. The breadsticks still did rise about an inch high. My family loves these breadsticks! I have made them many, many times for my family and once I made 4 batches -one right after the other- for my husband’s baseball team. However, twice they have not turned out well. Once, my daughter made them and we don’t know what she did wrong and last night I made them early and set them on the counter to raise and then put them in the oven closer to dinner time. Weird thing. They tasted dull and not worth the calories! I just read over the comments and really think it’s true–they have to made quick and easy, not wait around and cook. Wonderful recipe. Wonderful site! I just made these and Oh they are heaven. My husband said they have a wonderful taste. I didn’t have the garlic season but did use the garlic powder and Italian seasoning. Just before they were done I put some shredded mozzarella on top. The best.. Thank you for a wonderful recipe and I totally agree butter makes everything better and not that nasty margarine crap! These are wonderful! I had to let them rise a little longer but that’s due to my oven being weird. Not too greasy, light, fluffy, great taste. I didn’t have that garlic seasoning as well, so I sprinkled coarse salt, parsley flakes, basil, garlic powder, and oregano on top; worked great! I’m glad they make 36, perfect size, too. I’m making lunch for my husband’s coworkers and this recipe, with 36 breadsticks, will allow me to just make 1 batch, instead of having to double a recipe. Thanks for sharing! Jamie, I am baking these breadsticks right now and am keeping my fingers crossed that they will look like the ones in your picture! They smell great! I read some of the other comments related to this post and just want to thank you for all of your work. Our family loves and appreciates the recipes! Glad you have a backbone!! I’ve made your breadsticks before, but tonight I split the dough into two pieces. With the first piece I made breadsticks, only I topped with olive oil, rosemary, salt, and a bit of parmagiano. With the other half, I made something I usually use puff pastry for. I took scrambled eggs,a small amount of parmagiano, and a cooked vegetable mixture (onions, pancetta,and chopped arugula,olive oil and a bit of salt to taste) and combine in a bowl. Set aside. Drizzle olive oil in pan, and put dough in pan pat down and let it rest like you suggested because it does make it easier to spread. Spread the dough in the pan and put the egg/veggie mixture on half. Fold the other half over and use fork to crimp closed. If you like you can pierce the top with a few fork holes so that steam can escape. top with olive oil, parmagiano, and some rosemary or garlic salt..whatever your tastebuds desire! I made these and they were awesome and I will be making again and again, but there was only one problem it’s just me and my honey would it be okay to freeze them after I’ve cooked them? Wow, these were incredible! We have a dairy allergy in the family & I subbed melted coconut oil for butter. Just made these to go with our spaghetti for dinner, So delicious!! Definitely will be making again. FYI I believe the pan used is a half sheet pan. 12 X 17. I believe cookie sheets don’t really have sides, and a jelly roll pan would be too small for this dough. One night my husband and I were just craving breadsticks, so I did a quick search, found this, made them, and THEY WERE DELICIOUS!!!! Thanks for the recipe! I am going to be making these all the time now! 5 stars. Super soft and yummy. These are the kind that you can’t stop eating. Thanks for your feedback! So happy to hear you enjoyed them. Hi Jamie! I have been making these for several years now and just wanted to drop a note to say THANK YOU! Because of allergies, I’ve started making a vegan version for my nephews with allergies – it’s not as good as with butter but not quite crap 😉 LOL. So appreciative of your blog and again – LOVE this recipe. These were delicious, as was the red sauce!!!! They taste a lot like Pizza Hut.Sooooo good! My picky kids loved them! These bread sticks are the BEST EVER!! Can’t skimp on butter!!! Thank you so much Jamie!! We are so grateful for your blog! !I have tried other food blogs but I keep coming back to your tried and true delicious recipes. I think its been 7 yrs. now IDK?? Love you sweet,funny,witty, talented lady.